The Grange has won the 2017 Sanderson Cup, by defeating Glenelg 3½-1½, at Royal Adelaide Golf Club for the Club’s third successive A1 South Australian Pennant Flag. The Grange were well up in matches two and three thru nine holes and Jean Foo led Matilda Wheare 1-up at number five. Glenelg though, were right in the contest with number one Elysia Yap 1-up against Ella Adams and match four between Sarah Crocker and Louise Glennon all square. The Glenelg side were without the talented Charley Jacobs who had played number two all season but was out due to an ongoing wrist injury meaning a number of players had been pushed up the order. First match in was Caitlin Roberts for The Grange winning, 7&5, over Jill Hodge and then shortly after Jin-yun Young closed out her match with Josie Gale, 6&4, to give The Grange a two match early advantage. In match four Sarah Crocker for Glenelg edged ahead to claim the match, 3&2, against Louise Glennon to give Glenelg a much needed boost, but it was short lived as The Grange Captain Jean Foo closed out her match with Matilda Wheare, 3&1, by winning the third hole and securing the overall contest for her side. At the time, match one between Ella Adams and Elysia Yap was square resulting in a half match and official score of 3½-1½ in favour of The Grange. The Grange Team Captain Jean Foo, who along with Roberts had played in three consecutive winning teams, had nothing but praise for her players. “We are all really stoked that we won again this year and to have a really good team together to win three in a row. We were all really ready this season and didn’t take anything for granted as the Glenelg team girls were very good.” Foo said. 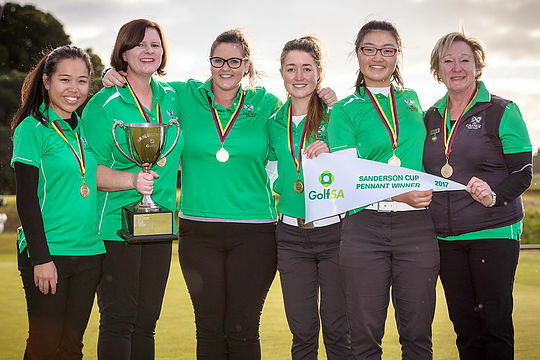 The victory was also the Grange Golf Clubs seventh Women’s A1 (Sanderson Cup) Pennant title.